In the Rite of Christian Initiation for Adults (RCIA), three weeks are devoted to the scrutinies — dedicated to self-examination, rooting out sin, and turning to God in repentance. They include reflections on three Gospel accounts where individuals encounter Christ: the stories of the Samaritan woman at the well (John 4:1-42), the man born blind (John 9:1-40), and the raising of Lazarus from the dead (John 11:1-44). Our thirst is quenched. The Samaritan woman at the well is thirsting for something. When she meets Jesus, he shows her that he is the living water that will quench her thirst. She is thirsting for love, acceptance, and even correction. Only after her heart is changed does he catechize her — showing her how her life must be amended. We see the world differently. When Jesus heals the blind man, the man’s vision is forever changed. When we discover Jesus, our eyes, in the spiritual sense, are opened too. New faith gives new eyes to see. We begin to see the needs around us. Evidence of encounter and conversion are seen in how we treat others. We become new. When Lazarus is raised from the dead, his life begins anew. Heaven is the goal, and we cannot get there if we have not had a profound change in the way we love God, others, and even ourselves. How can catechists be catalysts to help others encounter Jesus? First, middle, and last: PRAY! Pray for opportunities to share the faith and for the wisdom needed when speaking. Pray that the Holy Spirit may be in control of every encounter. 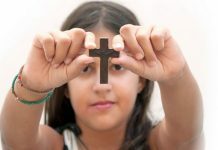 Here are 50 examples to help persons of any age connect better with Jesus. 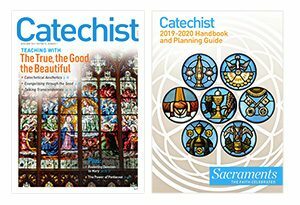 My thanks to the many catechists — and friends of catechists — who shared their ideas and stories with us. 1. A family member can enthusiastically whisper to a child right before the Consecration at Mass, “Jesus is coming! Look! He’s there!” There’s no need to explain transubstantiation to them; just convey Jesus’ arrival on the altar as the priest prepares to elevate the host. 7. Lead a prayer procession for opening prayer in your class. 9. When children are encouraged to visit Jesus in Adoration, the impact of a face-to-face encounter with Christ cannot be underestimated. Children have open hearts, and Jesus can communicate with them on a level different from adults. 12. Ask children to play Gospel charades. Have each group role-play a different Gospel story without using words. The other children guess which story it is. This helps children encounter Christ in Scripture and provides a great opportunity for a child to be Jesus for a short time. 13. 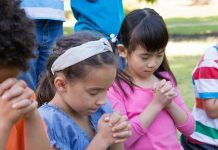 Encourage children to offer each day to Jesus. They can use the traditional Morning Offering or simply pray: Jesus, I offer this day to you. Be with me in all that I do. Amen. 18. Help teens meet Christ in prayer. Lead them through a guided meditation. 19. Meet Jesus in Scripture: Read and talk about what Jesus did and said. Teach Lectio Divina. This involves reading Scripture several times and focusing on different things at each reading. 20. Find Jesus in others, especially the distressing guise of the poor. Plan projects where the students work directly with those in need. Try soup kitchens, nursing homes, and so on. 21. Meet Jesus at work in daily life: Invite teens to think of “coincidences” that could only be attributed to divine intervention. 23. Allow time for silence. Teens are bombarded by television, music, and social media. Many have forgotten how to be silent and hear God’s voice in their hearts. Encourage time spent in complete silence. 24. Encourage teens to see Christ in those less popular or those who have greater needs within their own friend groups, school groups, and youth groups. Our youth ministry leader often pairs up a teen who is struggling with one who is a natural leader or gets along easily with others in the group. When we minister to another’s needs, we encounter Christ in that person and even in ourselves. 25. Invite teens to youth conferences and youth retreats. The energy, music, and witnesses of other teens adds to the positive experience of meeting Jesus. 27. Encourage young people to invite others to Mass and youth group. Make a friend; be a friend; bring a friend to Christ. 28. Ask permission to text a Scripture quote that is special to you every day for 30 days to someone. Tell them no reply is needed unless they have a question about a certain Scripture. 29. Type up a one-page testimony of how Jesus has been your best friend and has given you joy and peace. Photocopy them and place in envelopes. Put the testimonies in a place where you can access them anywhere to share with others. Distribute as the Holy Spirit prompts. 30. Do something nice for someone when they don’t expect it. 33. Set a good example of being Christ to others. 36. Encourage faith enrichment programs. Parishes can participate in several opportunities such as RCIA (Rite of Christian Initiation for Adults), Symbolon, Christ Renews His Parish (CRHP), Christlife, Cursillo, Bible studies, ACTS, and ministries supporting social justice. 37. Be obvious about your faith. Some parishes carry a cross through neighborhood streets during Lent. They invite neighbors to put a sticky note with a prayer intention on the cross. For some, the visual of the cross being carried and the invitation to prayer is the closest they have been to a faith community in years. 38. Take a friend to confession, Mass — or both! What better way to encounter Our Lord than experiencing his mercy and love in the sacraments! 40. 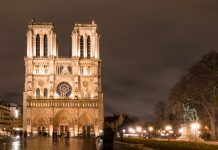 Leave your car radio on the Catholic station when you take your car into the shop, or when a valet will be parking it. 41. Keep copies of faith-inspired CDs in your car and distribute them whenever the Holy Spirit inspires you. 47. Carry out family service projects, such as clothing drives or serving at a homeless shelter. Invite a lonely person over for dinner or care for a sick family member. 48. Encourage an atmosphere of stewardship in your home. Start a “40 bags for 40 days of Lent” project. 49. Teach those learning the faith about the three scrutinies and how to apply them to examine their own hearts. 50. Give someone a copy of All In: Why Belonging to the Catholic Church Matters by Pat Gohn (Ave Maria Press, 2017), or some other book that shares the joys of being Catholic. Trust in God’s plan for the salvation of every individual you meet. You may not see the fruit of your actions, but you may have planted a seed that the Holy Spirit will nurture and grow into true faith. Mary Lou Rosien is a Catholic author and speaker with a masters certificate in catechesis. Her experience as a catechist includes being an RCIA coordinator, Confirmation instructor, pre-Cana instructor, and assisting in youth ministry. Find her website at CatholicFamilyBootcamp.com.